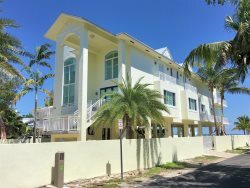 WELCOME TO CUDJOE KEY AND PORT ROYAL RETREAT! This charming coastal chic home looks like a Chip and Joanna Gaines (HGTV) redo! Nice 9000 square foot lot with lots of room to play. Canal front with new 60' composite dock and great boating out to Cudjoe Bay. Easy access to both the Atlantic and Gulf waters. Up the stairs is the new wrap around patio with cable railings. As you enter the front door to the right is the large open kitchen with gorgeous granite countertops and beautiful wood cabinets with stainless pulls. The kitchen boasts a new refrigerator, oven, microwave, dishwasher, coffee maker and comes equipped with a stacked washer and dryer. To the left is the living room with a new leather sectional and large TV with cable and Wifi. The main bedroom has a new king size bed with lots of closet space. Second bedroom has twin beds and also lots of closet space. The bathroom has a barn style door with large glass enclosed shower and all new furnishings. Wood floors throughout with crisp white plantation shutters covering all the windows giving it that coastal chic charm. Nice quiet neighborhood for walking and biking or just enjoying the relaxing space under the house with BBQ and picnic table. The famous Square Grouper restaurant is 5 minutes away by car or a mile and half walk. Winn Dixie Shopping center is about 12-15 minutes in Big Pine Key. Murray's gourmet market is 5 minutes away in Summerland Key along with a Slice or Paradise Pizza that delivers, Summerland Wine and Liquors, The Galley Grill for breakfast and lunch, Boat rentals, Shell Gas station, Dion's gas station and it's famous fried chicken, Ace Hardware, Post Office, and Banks. Cudjoe Sales (a fisherman's candy Store) is also just about 5 minutes away in Cudjoe Key. Cudjoe Gardens Marina sells gas, bait, and supplies and also has a boat ramp. Bella Luna Italian restaurant is about 10 minutes south before you get to Cudjoe Gardens and is very good. And last but not least you are only 23 miles from the ever amazing Key West with all the restaurants, bars, night life, and entertainment that you would want in the Fabulous Florida Keys!! Not to mention being in the fishing and dive capital of the world! You won't be disappointed with this rental. Book it now! Utilities capped at $300. tenant responsible for any overages.